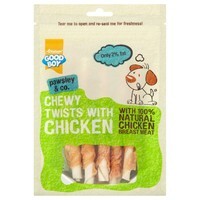 Good Boy Pawsley & Co Chewy Twists with Chicken are 100% natural meat treats that your dog can really get their teeth into. Made from quality chicken of human grade, these delicious treats have been oven roasted to further enhance that rich meaty flavour that your dog loves. A tasty treat for any time, your dog is sure to adore these Good Boy Twists with Real Chicken! Great price and fast delivery ,goodboy is a name I have trusted for many years. 5. This product is great and very popular with my German Shepherd, who is very fussy!.